Even after everything that I've made in the history of my blog, this is my most favorite. It has everything I love in a great dessert: thick buttery pound cake, lovely sweet berry flavor, a glorious vanilla pastry cream, and dreamy whipped cream. This is my idea of comfort food. Although I never asked the lady for the recipe, I came up with what I think is a very close approximation. I dare say it might even be a little better. I've made this several times: for BBQs, baby showers, birthdays, and it's always a sure fire hit. If you're looking for a good Sara Lee Pound Cake copycat recipe, you will LOVE the one I included below. I learned about it from my friend Emily who made it one day at work and I couldn't believe how good it tasted. The secret is Vanilla Butter Nut Extract, which can be a little hard to find depending on where you live. Yield: The big trifle with the flowers on it fed *a lot* of people; I'd say roughly 30-40 servings, depending on the portion size. The smaller one feeds about 15-20 servings. Fresh Fruit Layer - This is optional. It provides a colorful layer of fresh fruit for your trifle that brings a bit of visual interest to the look of the dessert. If you're using a textured bowl or one that is opaque in color, then this step is not necessary. If you want to include this then you will need a pint each of any fruit fresh fruit that you're using in the trifle. Typically and depending on the availability of the produce, I like to use strawberries and blueberries because they look the best. Raspberries and Blackberries tend to be too soft and get mushy looking against the glass of the trifle bowl. Inspect the bowl that you're going to use, inside and out, being sure to remove any fingerprints that may appear on the surface of the glass. If you're including a fresh fruit layer, clean and rinse the strawberries and any other fruit you might be using. For the strawberries, slice up a few lengthwise and reserve the larger, red center pieces that have good color. Keep all the ones that are of similar color, shape, and size. Lay each slice on a layer of paper towel. Dry the blueberries or other berry on paper towels too. How much will you need? It's hard to tell you how many slices you'll need because it depends on how thick you slice them, the circumference of the bowl, and how far a part you want to space them. For a 15 cup trifle bowl, I used about 10-14 slices of strawberry and the same amount of blueberries. Put the pastry cream in a pastry bag -- no need for a tip. Put the whipped cream in a pastry bag with a star tip of your choice. 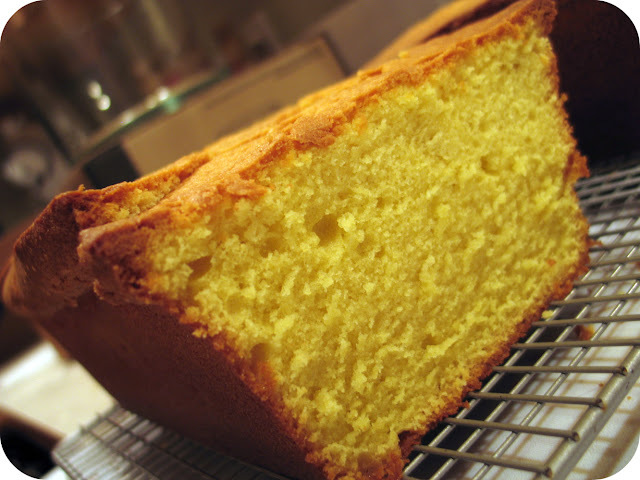 Remove the outermost layers of the pound cake and save in a separate bowl. Cut 1/2 inch slices from the cake. Mix up the berries and carefully cut up any big strawberries with the side of a spoon. This trifles is three layers deep. Each layer consists of cake, berries, pastry cream, and whipped cream, in that order. Carefully pipe a layer of pastry cream around the edges of the bowl, working in a spiral to the center. The most important part of the spiral is the outermost edge; the rest of your spiral doesn't have to look perfect. Carefully piper a layer of the whipped cream around the edges of the bowl, working in a spiral to the center. The most important part of the spiral is the outermost edge; the rest of your spiral doesn't have to look perfect. Gently arrange a second layer of cake slices into the top of the first full layer, being careful not to pack them too solidly. Cut small pieces to fit in empty spaces until the bottom is close to being one solid layer of cake. Add your fresh fruit layer. I like to start with the strawberries and place them one at a time, across from each other, working my way around the bowl. I find this works better than placing them side by side because I always end up with a space that's too big or too small for another whole strawberry slice. Once you place a strawberry slice against the glass of the bowl, you really don't want to remove it. If you do it will leave a little footprint behind and you'll need to wipe the glass off before you can continue. To the right you'll find a little diagram that helps you to understand the method I use. The red circles with the numbers are the strawberries in the order that I add them and the little blue circles are the blueberries. 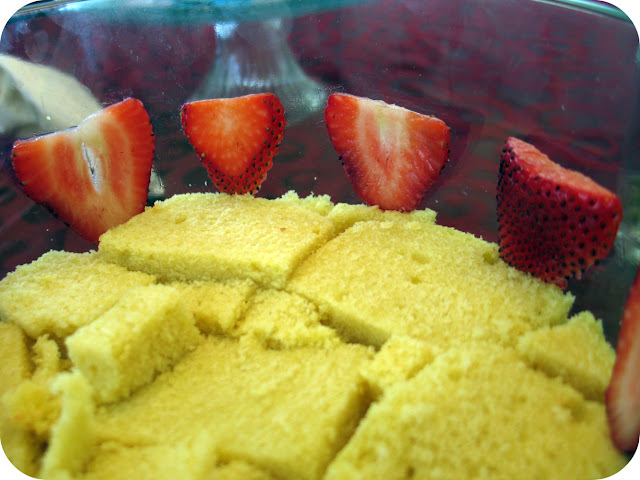 The bottoms of the strawberries should just be touching the top of the last layer of pound cake. Add a layer of pastry cream and pipe it behind the fresh fruit that's stuck against the side of the bowl. 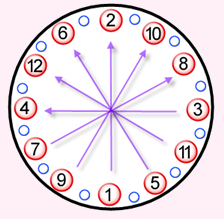 Continue the spiral to the center. Add a final layer of cake just as you did with the previous two layers. Add the berries and be a little more generous with the juice and the berries. You don't want to add too much more, but just enough that it causes a nice trickle-down effect down through the other layers of the dessert. Carefully pipe a layer of pastry cream around the edges of the bowl, working in a spiral to the center. The most important part of the spiral is the outermost edge; the rest of your spiral doesn't have to look perfect. Finally, pipe the top with whipped cream. 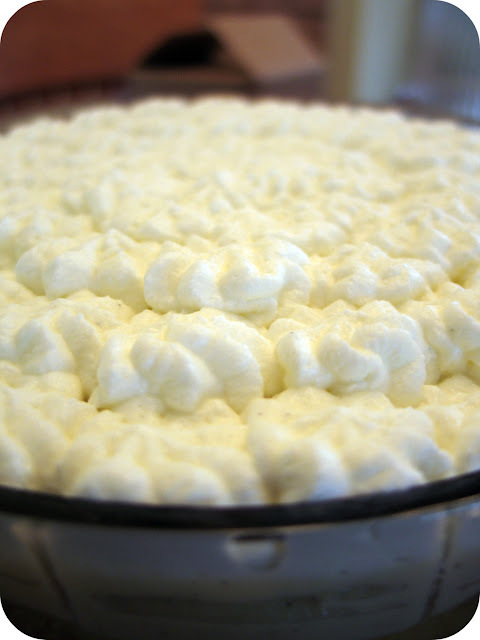 You can spoon it on and then smooth it out with a spatula or you can pipe little stars of whipped cream all around the top in concentric circles until you get to the center. Cover and store in the refrigerator for at least 8 to 24 hours - the longer the better. Seriously, don't try to cheat and only refrigerate it for 2 hours and expect the magic to happen. 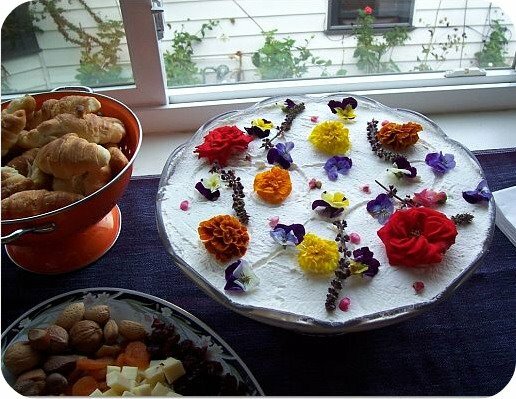 Decorate the top with edible flowers or pieces of fresh fruit. Preheat oven to 325F. Grease and flour 9x5-inch loaf pan or spray with Pam with Flour; set aside. Beat butter, sugar and sour cream in large bowl with electric mixer on medium speed until light and fluffy - about 5 minutes. Add eggs, 1 at a time, beating 1 full minute after each addition. Add extract and mix for 30 seconds. Gradually beat in flour mixture until no traces of flour appear in the batter (about 1 minute or so). Pour into prepared pan and smooth out the top. Place the pan on a thin cookie sheet and bake 1 hour and 10 minutes (maybe as long as 30 minutes) or until toothpick inserted in center comes out clean. Cool in pan 10 minutes, then remove from pan and cool completely on wire rack. Sprinkle with confectioners' sugar, if desired. Note: This is best made two days in advance. For the trifle, store uncovered and unwrapped so that it gets a little stale. If you're making this for something other than the trifle, wrap it in plastic or store in a covered container. 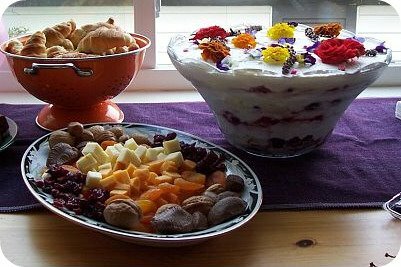 A day or two before you want to assemble the trifle, dump the frozen berries into a large bowl. Pour the sugar over the berries, add 1/2 cup of water, mix it up, cover, and stick it in the fridge. Every 12 hours or so, mix well. This recipe isn't one that's measured out perfectly and you'll more than likely have cake, pastry cream, berries, and whipped cream left over. And since I typically make this for some big event, I rarely get any. So, if you're in the same boat or have a neighbor or friend you'd like to treat, do what I do. Take some of the cake cuttings that I have left over, break them up into smaller pieces. Combine it with any left over pastry cream and any left over berries, juice and all. Mix it up well and squish it down into a small bowl so it's about 2-4 inches high. 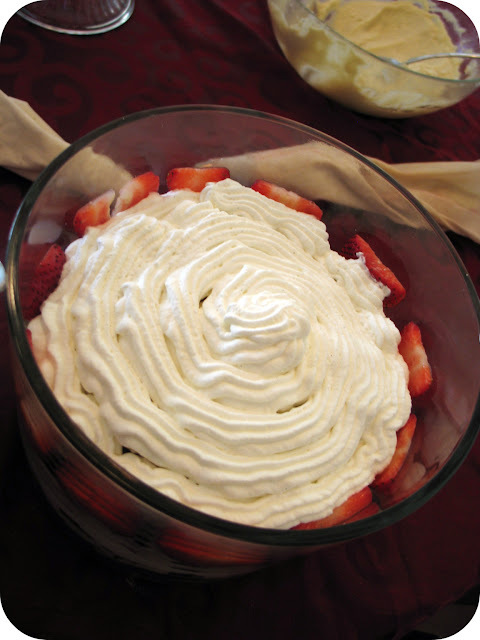 Spread any left over whipped cream on top and stick it in the fridge overnight. It won't be as pretty as your trifle but it will be super yummy! with a trifle like that i wonder why you even bother putting other food on the table... i know what i'd be eating!! As a matter of fact I'm having a bbq next wwekend (was suppose to be tommorw but was cancelled) this would be perfect! 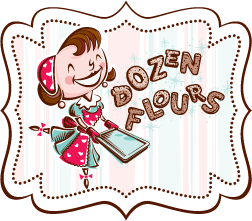 I just discovered your blog a few days ago (from Donna- My Tasty Treasures) and I read through all your posts and bookmarked several recipes. Oh good God we so think alike!! I'd be digging in the bowl at midnight! I made a fruit dessert tonight, too. Gonna upload the pics and post in a sec. The flowers on the trifle are SO pretty! 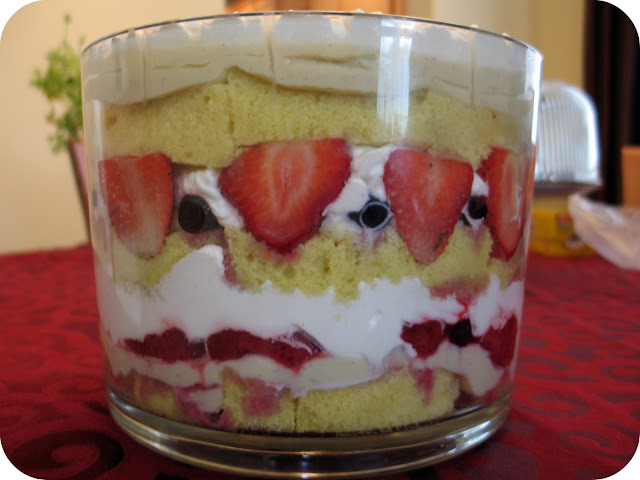 i love trifles--they're so fun to put together, beautiful to behold, and even more thrilling to eat. 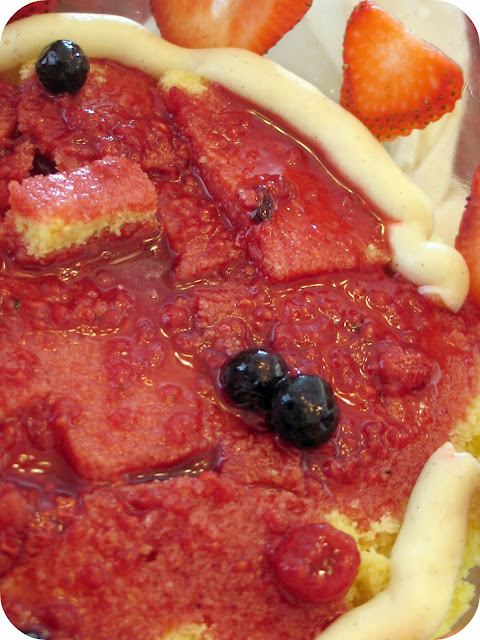 the fruit juices seeping into the cake just makes for a perfect summer treat. ok, I am going to make this for a lunch meeting next Sat, so I need to start with the cake and pastry cream Thurs night so I can assemble Fri night. I am just confused for the smaller one do I need to do 2 pound cakes? I am feeding 21-25 women.It looks just wonderful, can't wait to try it! Wow, this is such fun to even watch! :) Am sure it was double fun to put together! Snugs -- I'd go with making 1 1/2 recipes worth. That will give you two full loaves of pound cake. You might have extra ingredients left over but you'll have more than enough to feed everyone, especially if this is the star of the dessert table and you expect everyone to get a good sized serving. That's what I did with the punch bowl sized serving. And yes, I'd start it on Thursday and assemble it on Friday. But Saturday it will be perfect. You and your guests will LOVE it. :) Please let me know how it turns out! Mmm, this trifle sounds delicious. Man oh man, when you say this is one of your all time favorites, you know that I can't help but run to the kitchen to try it out :) Looks so darn good! Sorry I've been away from blogging/commenting for so long. I just finished up with my exams and am finally getting around to my google reader :) Everything looks delicious! I love vanilla butter nut extract! I have never made a trifle before, but I have eaten my fair share!!! Wow, this looks amazing although I must admit, it looks really intimidating. Mmm, I love trifles. I love all the layers. The best thing about them is they're super easy to make. Yours looks so pretty with all the flowers. i love a nice, squidgy trifle! this looks great, and is sooo big! Oh wow your trifle looks so beautiful! Julia, I fixed the trifle and it turned out wonderful, well, that is after I burnt the first batch of pastry cream and learned my lesson! Thanks for the recipe, everyone loved it! As the very lucky lady for whom the first shower was thrown, I can solemnly and longingly vouch for this recipe! It was incredible. And, what made it even more special, was something that tasted that good, and looked that gorgeous could only have been made with love and a lot of friendship! I'm thrilled I checked out the blog and can try to recreate it myself after 6 years (the baby boy is now 6, going on 7!). :-) Hugs Julia!